Do you have a taste for shrimp, but find yourself lacking the paleo shrimp recipes to satisfy your craving? A lot of individuals add shrimp to pasta dishes and create a cream sauce to go with their dish, but when you are following a paleo regimen, these recipes are not an option. There are a plethora of paleo recipes that utilize shrimp that are available for you to try, and most of them are not too difficult to create. 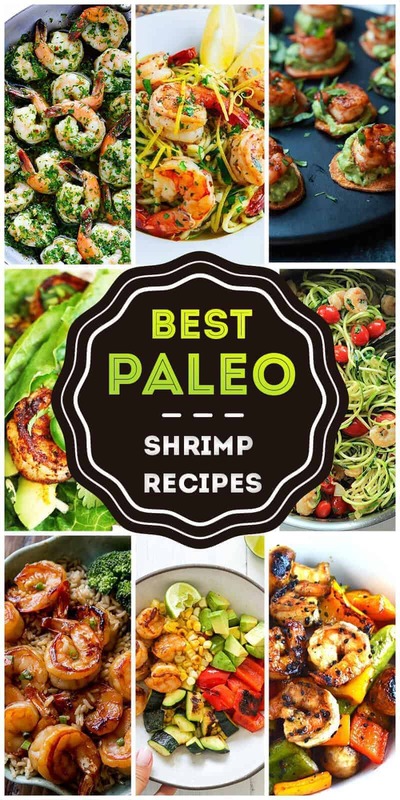 This guide will provide you with 50 different paleo-friendly shrimp recipes that are simple to create in your kitchen at home. Let’s dive right in. This recipe for paleo shimps combines the savory flavor of garlic with the spiciness of red pepper flakes. 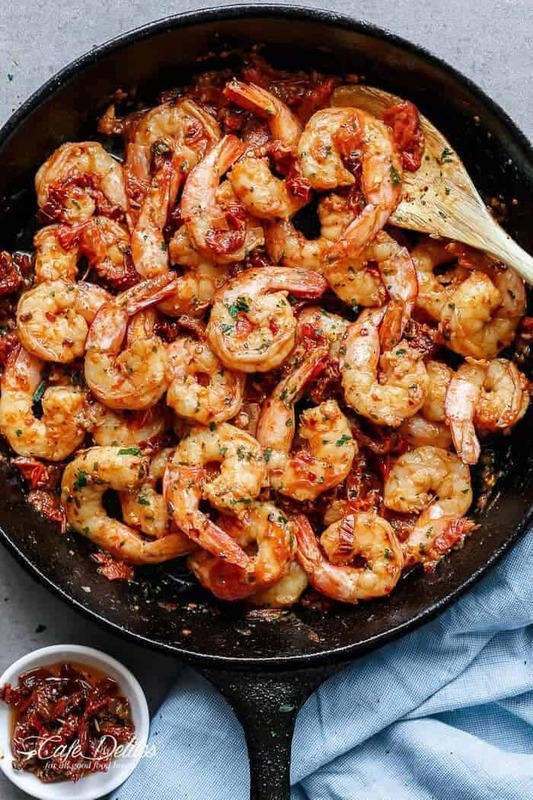 On top of this flavor combination, sun dried grape tomatoes are added in with the shrimp to create a subtle sweetness to the shrimp that will taste perfect together. If you want to have a side, a salad or a small serving of zucchini pasta is perfect with this dish. Make sure to add some basil to the dish because it complements the sun dried tomatoes perfectly. Honey and soy make the perfect salty and sweet combination for a sauce that tastes perfect with paleo shrimps, but the best part is that slight taste of spice from the sriracha. If you use jumbo shrimp and allow the sauce to thicken just a bit, it can double as a dipping sauce that is perfect for the shrimp. This dish is best served with some carrots, and if you like, you can glaze them in the same sauce. Easy garlic shrimp, as the name implies is an easy recipe to make; in fact, almost anyone can cook the dish right in their kitchen. 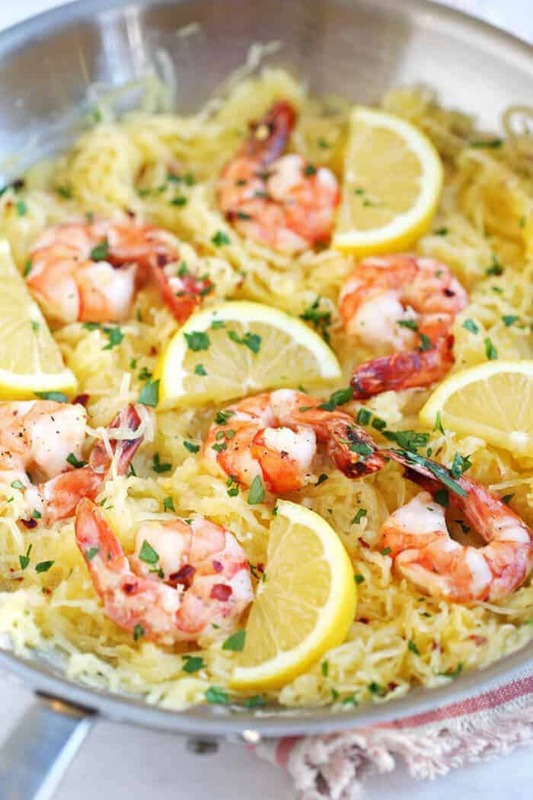 Garlic and lemon combine in this dish to create an amazing flavor that is simply irresistible. You can use lime juice if you prefer, but either way, marinating the shrimp before you cook it will enhance the flavors drastically. The perfect side for this dish is a simple arugula and red onion salad with lemon juice. 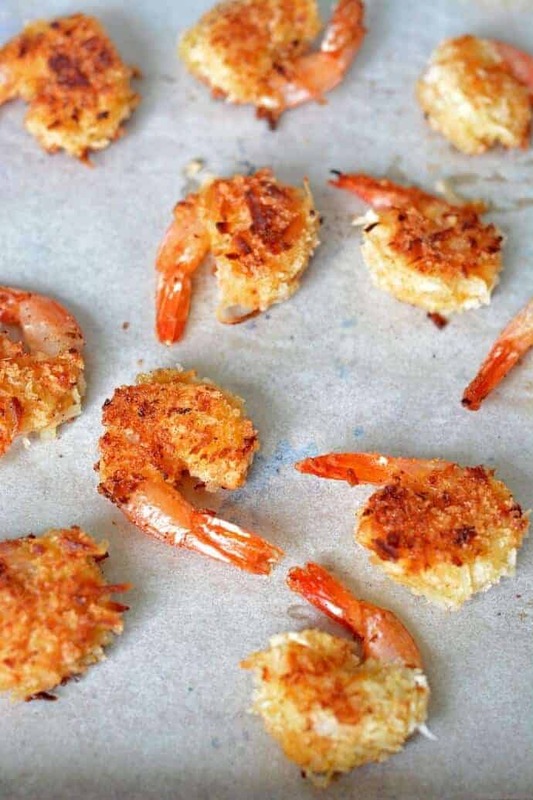 Another paleo recipe that you may want to try is coconut shrimp. The fried shrimp creates a perfectly crispy exterior that is sweet and savory all at the same time. 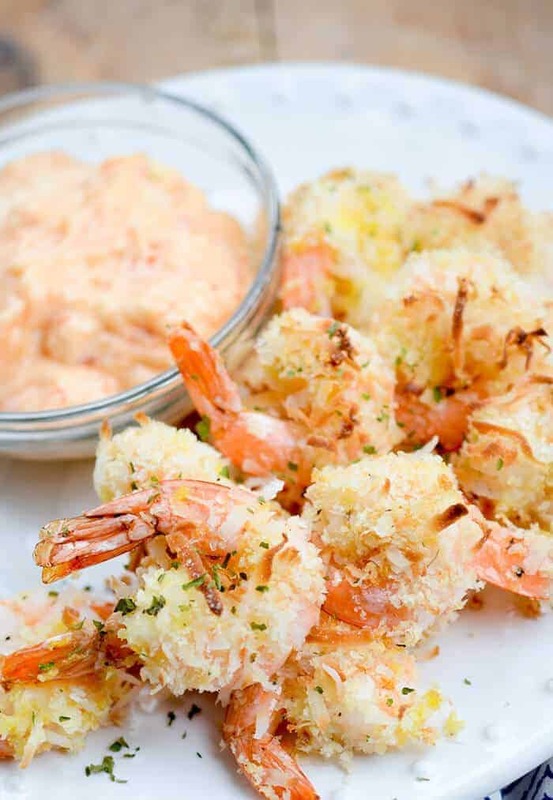 To increase the coconut flavor even more, you can fry the coconut covered paleo shrimps in coconut oil. You will love the results, especially if you create a sweet citrus sauce to dip them in. If you don’t want these shrimp as a main course, they are also a perfect appetizer for when you have guests. Bam Bam shrimp is a spicy dish that uses hot sauce and chipotle chilies to create a unique flavor. It also utilizes one of thefavorite paleo food options: honey. Just a touch of honey changes the flavor of this dish from extremely spicy to a perfectly flavored dish. 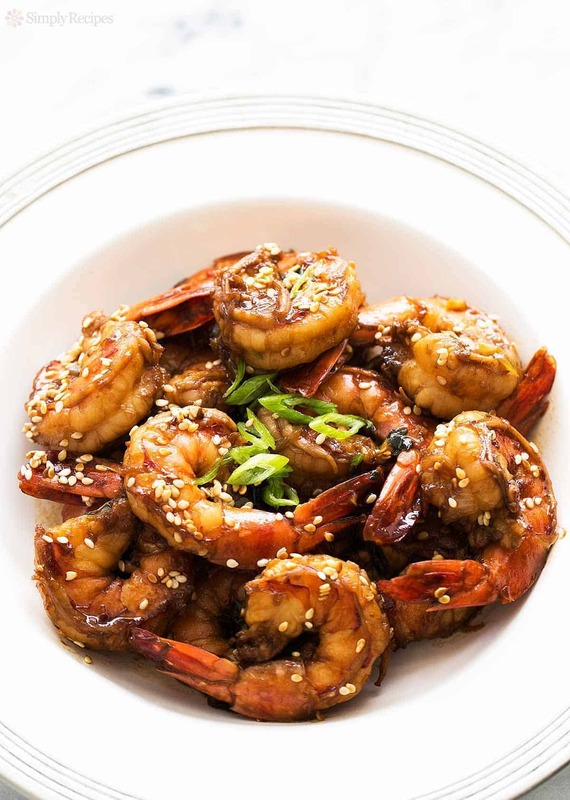 Once the shrimp is cooked and coated with the sauce garnish the dish with sesame seeds and serve the dish with a tossed salad or something that is not as flavor intense as the shrimp. A paleo diet prevents you from eating carbs, but this recipe is a unique creation that you will love even more than a carb filled meal. The shrimp is once again spicy, but this time it only utilizes cayenne, garlic, and chili powder to create the flavor. 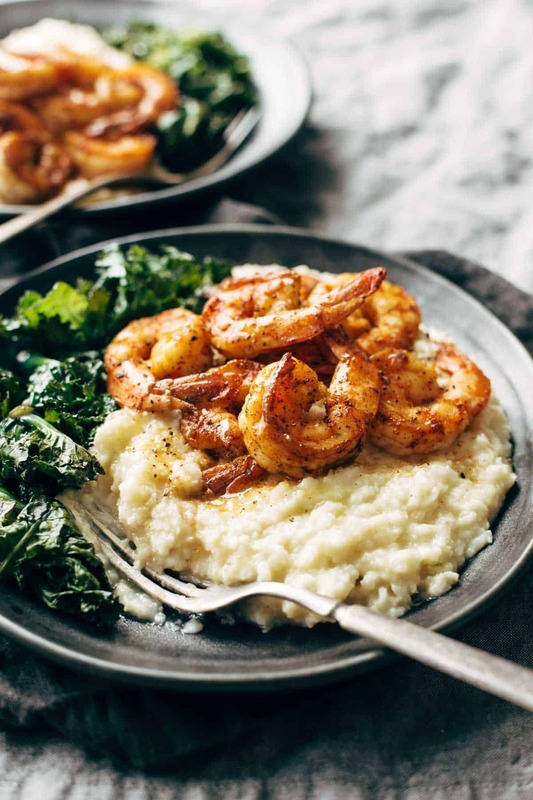 As a side, create a cauliflower mash to soak up some of the sauce from the shrimp. Also, the kale will taste amazing sautéed in a tiny bit of bacon grease. Shrimp scampi is one of the tastiest shrimp dishes you can create, but when you are on a paleo diet, you need to make some changes to the recipe. 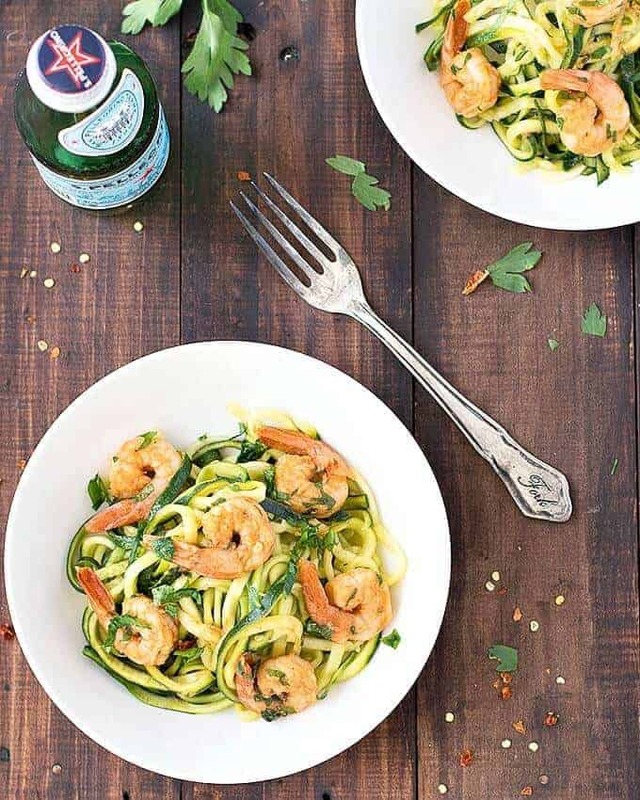 Instead of traditional noodles, you will want to have these paleo shrimps with zucchini noodles. It is a lighter alternative that gives the original recipe a run for its money. 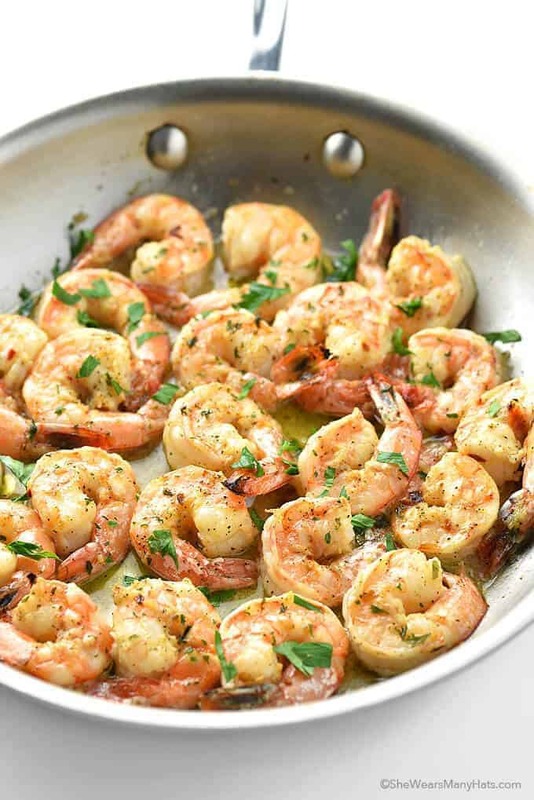 Make sure to add a little bit of white wine to the lemony, garlic shrimp to seal in the flavors that you love. Coconut is used in a number of paleo shrimp recipes. It adds the perfect sweet, crunchy exterior to a succulent piece of shrimp. Fry large paleo shrimps in coconut oil until they are brown and crispy. Since the shrimp is sweet, a spicy dipping sauce is the perfect complement. Cook the peaches until they break down, and add some thai chili sauce into the mixture. The peaches are rather sweet, so add as much spice to the sauce as you like. 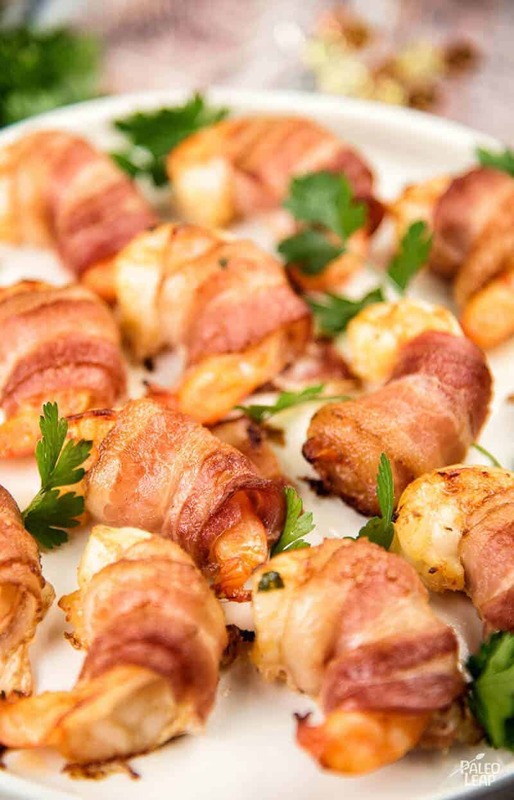 Another one of the paleo shrimp recipes that you will want to try is this bacon wrapped shrimp one. It combines garlicky, buttered flavored shrimp with bacon, what more could you want to satisfy your shrimp craving? This recipe is baked as well, so that is an added bonus, just make sure to leave it in the oven long enough to ensure that the bacon is crisp. A nice tossed salad goes perfectly as a side dish to enjoy with this recipe. One of the paleo food options that we have not seen much on this list yet is a stir fry. Shrimp and vegetables go great together, and this dish is perfect for anyone following a paleo diet. 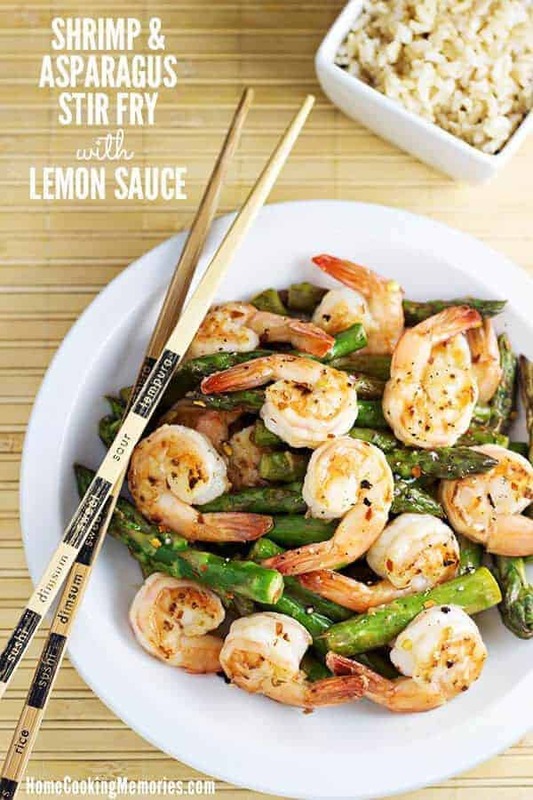 The sauce for this recipe is a delicious lemon citrus sauce that accompanies the shrimp and the asparagus well. Other vegetables can be used as well if you prefer, but be careful not to overcook the shrimp as you stir fry. 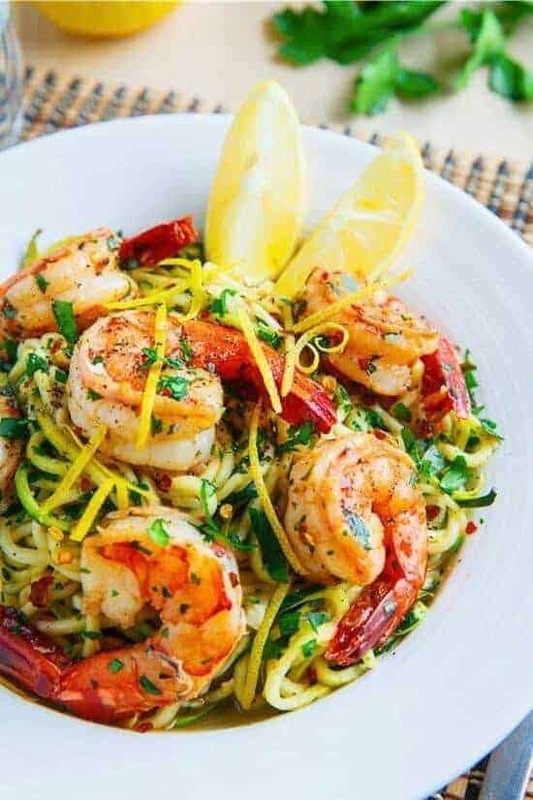 This is another one of the paleo shrimp recipes that utilize zucchini noodles or zoodles in the meal instead of traditional noodles. This simple substitution eliminates the carbs, the gluten, and a lot of the calories that this meal could have and makes it a much fresher paleo food option. 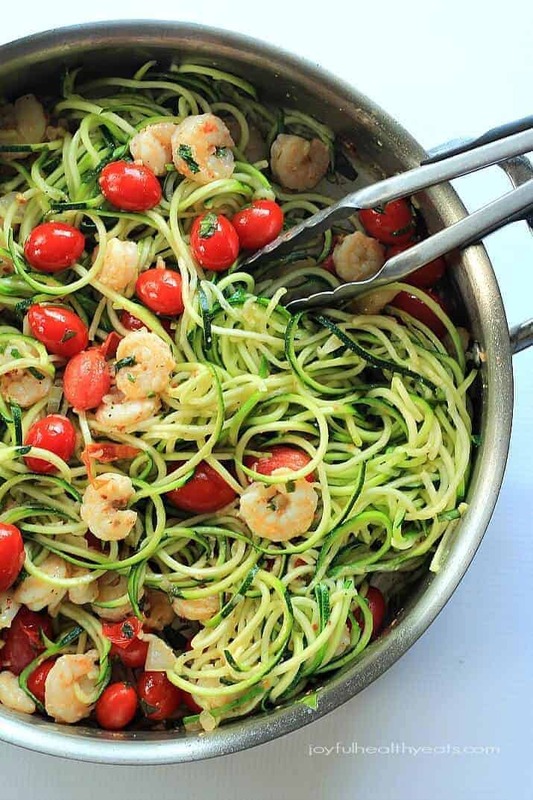 The garlic marinated shrimp will be the perfect complement to the zucchini noodles, just make sure to let them rest so that the zoodles do not become soggy from excess sauce. This next dish on our list is a quick and easy recipe that you can create without going off the rails of your paleo diet. 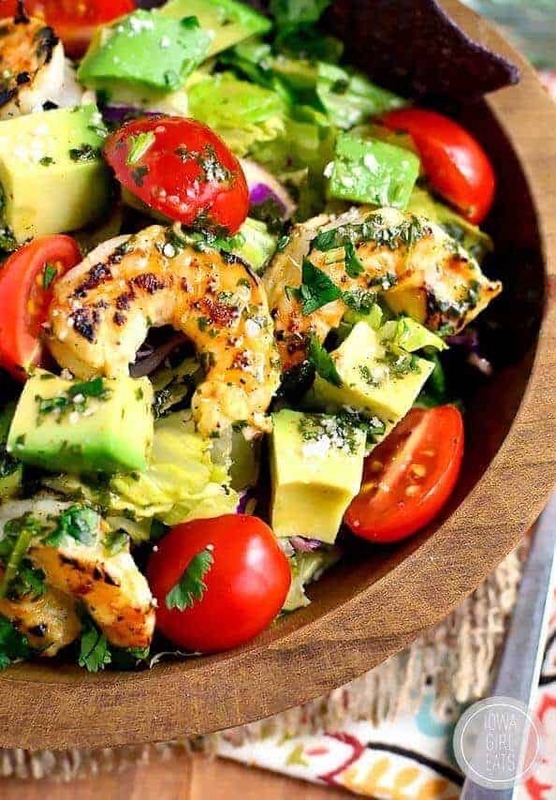 Avocado is a delicious paleo food that is high in fat, but it is good fat, so adding avocado into a salad with shrimp is perfect for this list of recipes. A lime juice and cumin dressing will add a slight bit of spice to the dish that will have you wanting more. 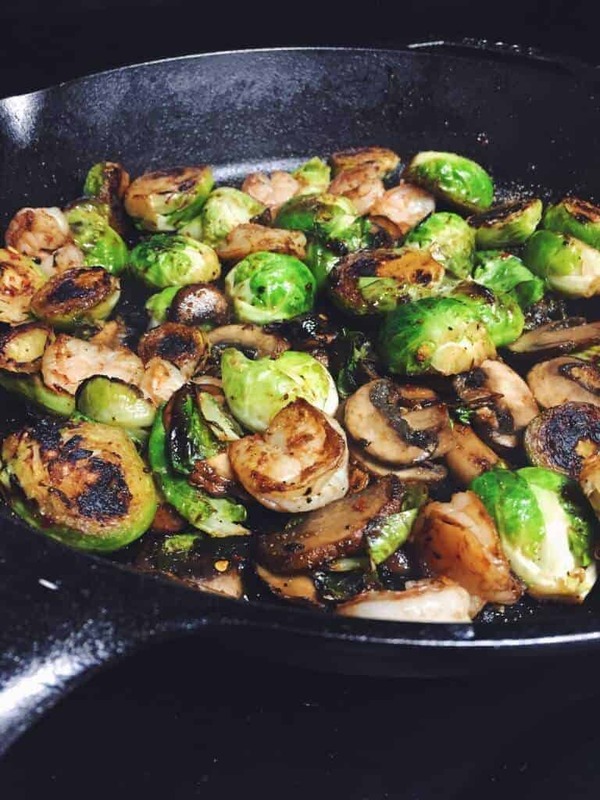 This one skillet paleo recipe is perfect for anyone who loves a taste of the Mediterranean in their food. 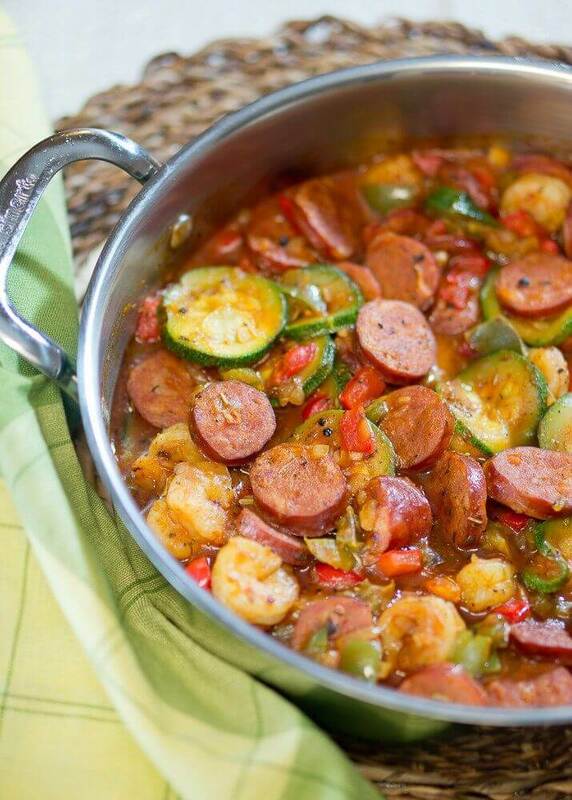 This dish combines sausage, shrimp, zucchini, peppers, and onions to create a unique flavor that low in carbs and full of flavor. If you prefer a spicier flavor, red chili flakes are perfect in this dish. If you want to add more to the skillet creation, other vegetables are also an option. The next dish is one of the paleo shrimp recipes with a honey glaze, but this one incorporates garlic into the sauce as well. 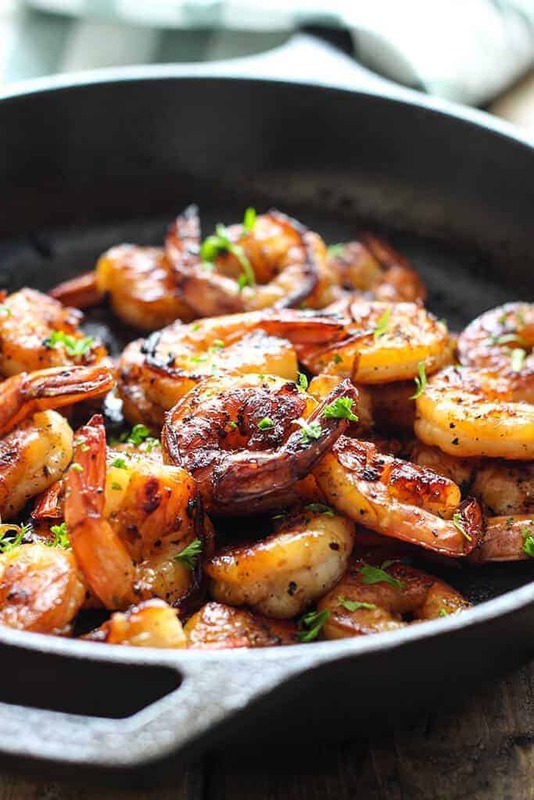 The honey will caramelize onto the outer layer of the shrimp to create a deliciously blackened flavor that tastes like it was created in a restaurant instead of created in your kitchen at home. If you want a bit of freshness added to this dish, you can add some cilantro into the skillet right before the shrimp is finished cooking. 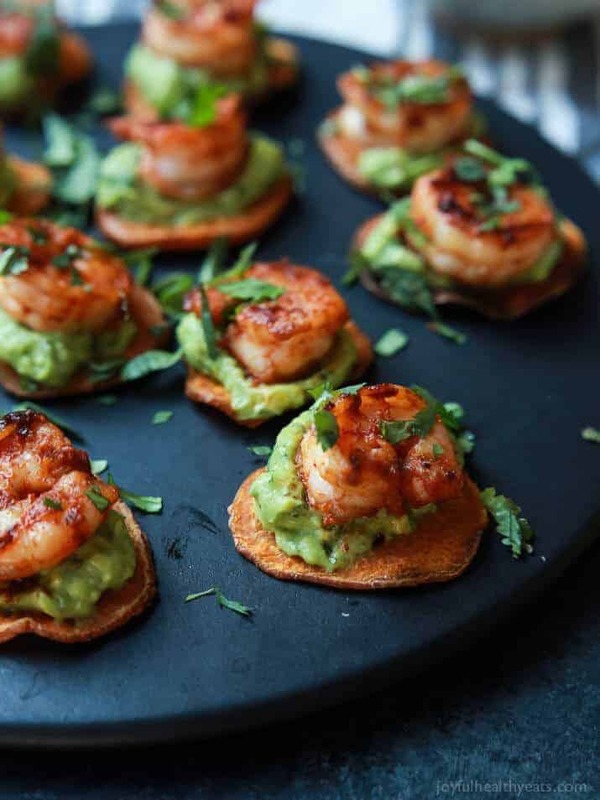 These Cajun Shrimp Guacamole bites are the perfect paleo food to make when you are entertaining guests. Shrimp cocktail is a boring dish, but this one adds a bit of spice because the paleo shrimps are cooked in chipotle chili powder. The spice is then cooled by the guacamole, or you can add a bit of spice to that as well. The shrimp is served on a sweet potato chip, or you can even enjoy it wrapped in lettuce. When you are looking to cook paleo food, you need to have some meals in your recipes that are quick to create. This honey garlic shrimp only takes 20 minutes to create. 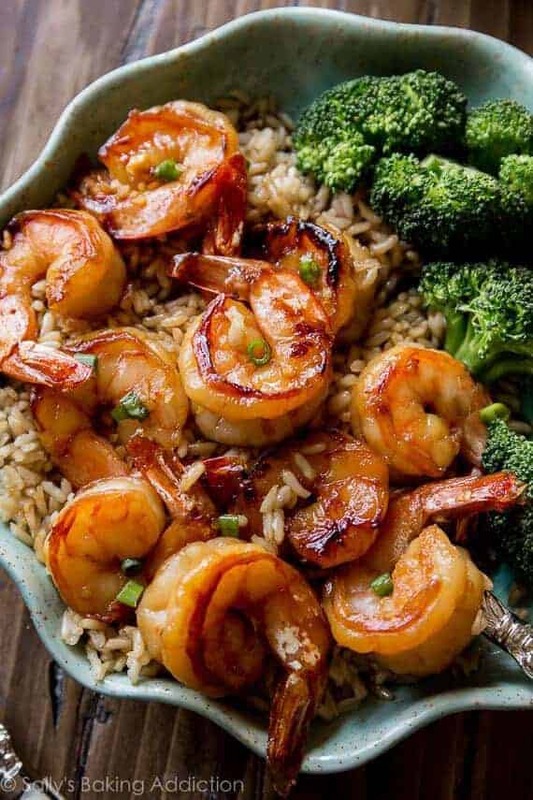 The shrimp is sautéed in a honey, garlic, and soy sauce marinade that is perfectly sweet and salty, but if you want a more complex flavor add in some ginger as well. This dish is perfect over riced cauliflower, but you can also sauté vegetables in the sauce if you wish. Lettuce wraps are a meal that gives you a sandwich type creation without all of the carbs that you get from a traditional sandwich or wrap, which is perfect for a paleo diet. 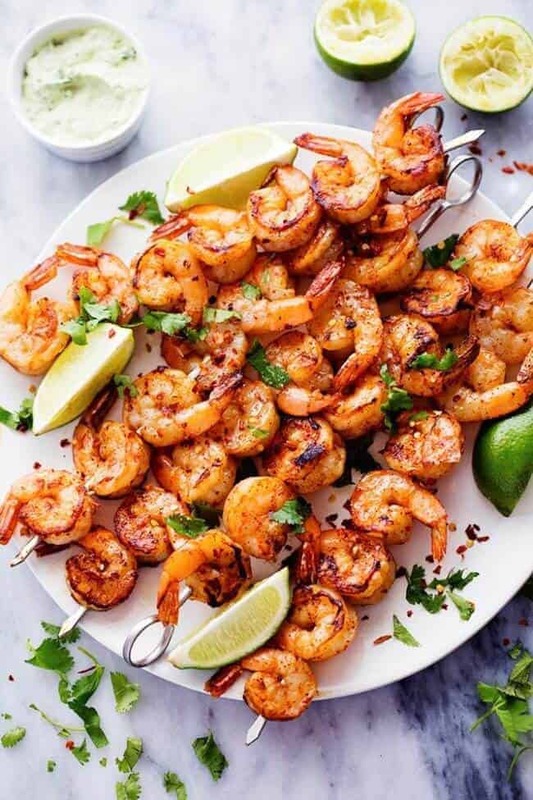 This recipe is bright and fresh; it has honey lime marinated shrimp for a bit of zing, fresh jalapenos to add a bit of heat, and cilantro to make the dish pop. Don’t forget to add the avocado to help cool the heat of the jalepenos. 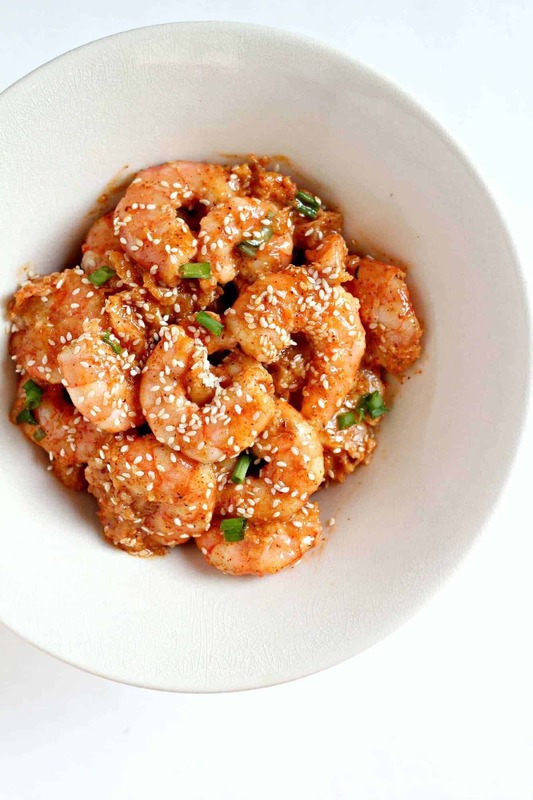 This next dish is an example of one of the paleo shrimp recipes that are Asian inspired. This one is stir fried in sesame oil, ginger, and garlic. Before the shrimp is cooked, it should be marinated in a mixture that is both sweet and salty because that will give the shrimp a nice caramelized coating when it is stir fried in the high heat of the wok. Garnish the shrimp with green onions and sesame seeds to add to the dish. See also, these yummy and tasteful breakfast recipe inspired by the Paleo way of life. 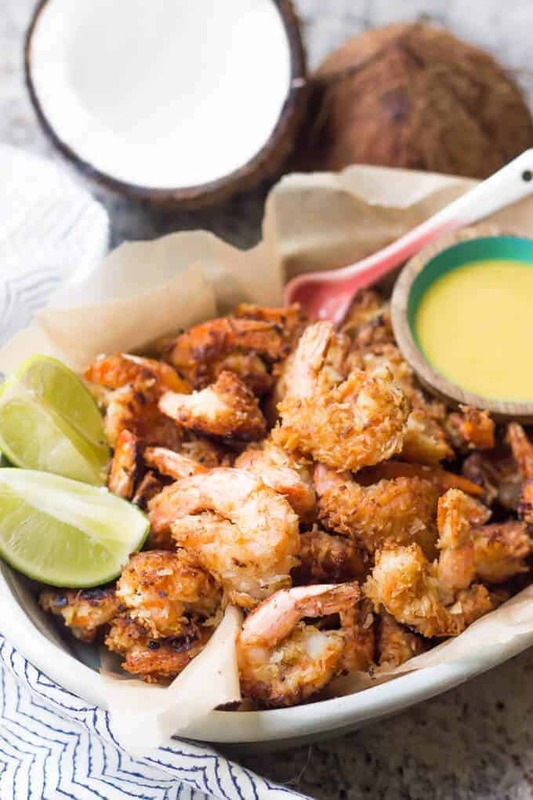 We have covered a few coconut shrimp paleo recipes already in this list, but this one actually calls for you to bake the shrimp instead of frying it, which makes it healthier. Large shrimp will be best for this dish so that it does not dry out too much in the oven, and once the coconut crust is browned, you should create a unique citrus-based sauce to dip it into. Riced cauliflower or a medley of vegetables can accompany the shrimp. 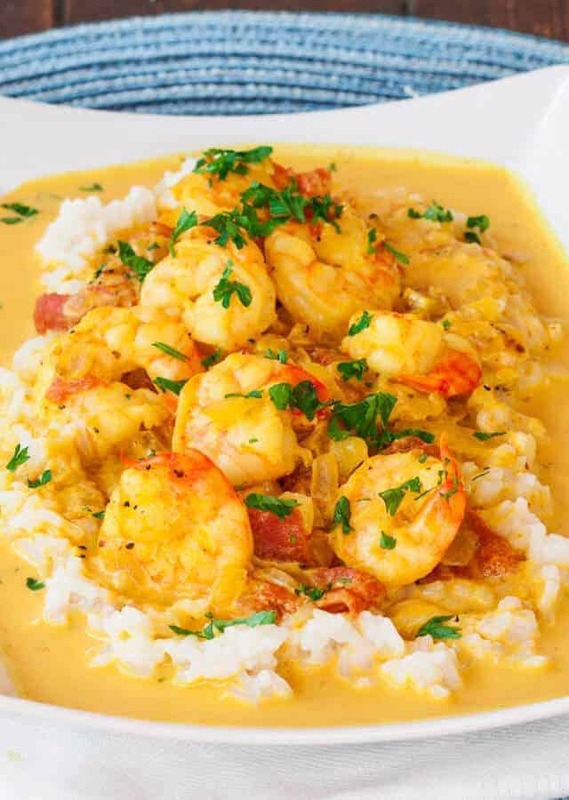 If you are a fan of curry dishes, then this is one of the paleo shrimp recipes that you must try to create at home in your kitchen. The shrimp is marinated in a cayenne and lime sauce, and then it is cooked in a mixture of spices that will create a delicious curry dish. Use coconut milk instead of traditional milk in this dish, and serve it over riced cauliflower instead of rice. If you want a kick to your curry, add in extra cayenne and curry powder. This dish has become one of the most popular paleo shrimp recipes out there. To create this dish in your home, you’ll need stronger flavored ingredients like honey, garlic, and ginger. Stick to larger-sized shrimp for a delicious meal that will be both filling and paleo-friendly. If you’re looking for a paleo-conscious accompaniment for this dish, then throw in some riced cauliflower and some roasted broccoli for a truly unique and flavorful experience. Spaghetti Squash is a unique vegetable experience that emulates the delicious flavor of its namesake pasta, without loading you down with paleo-unfriendly carbohydrates. Once the spaghetti squash is baked, it easily comes apart with a fork and forms delicious spaghetti-like strings that go great with a plethora of dishes. Simply add roasted buter and garlic shrimp and a white wine-based sauce for a near perfect paleo recipe that you’ll love. 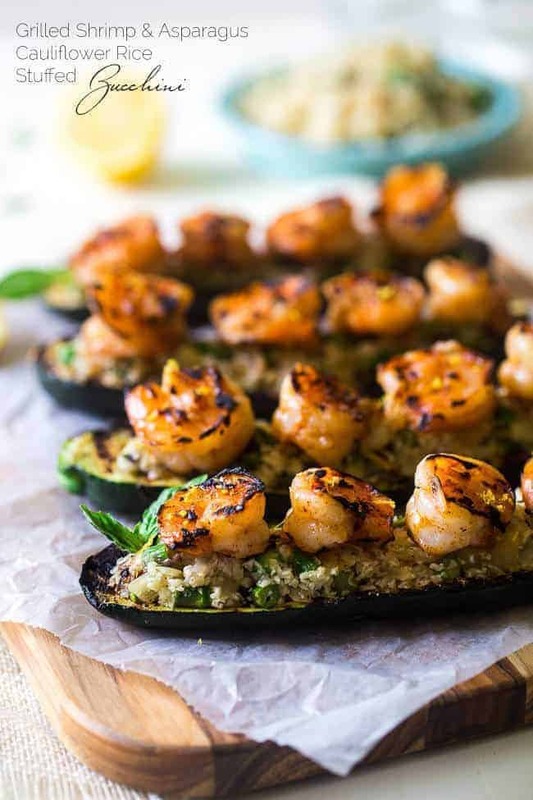 To create zucchini boats, you simply take two large zucchinis and cut them in half, but the inside of this vessel is where the flavor really is.It is filled with cauliflowered rice and some shrimp that you’ve marinated in honey and garlic and grilled. You can also simmer an asparagus and onion mixture to add it to the boats if you want. Be sure to grill the stuffed zucchinis to complete the flavor profile of thisdelicious yet easy recipe. 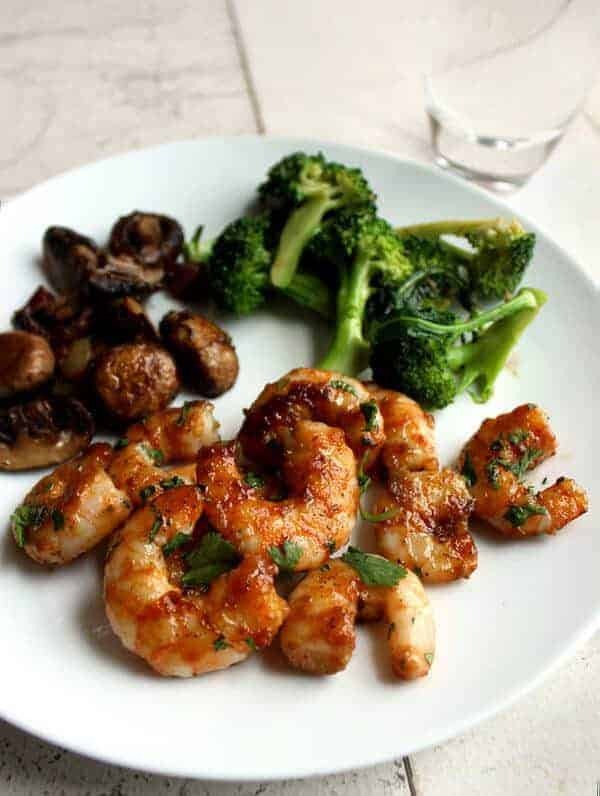 Another great example of a dish that uses the deliciously perfect shrimp as a paleo food, sticky shrimp has been a favorite meal for decades. Creating this dish in your kitchen is really easy; all you’ll need is some large shrimp, some white wine, and some seasonings. Fry these seasoned shrimp in a bit of bacon grease, and you’ll be in for a treat. You can serve this dish with roasted broccoli and mushrooms if you’re looking to craft a full meal. 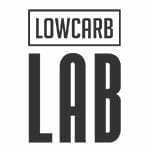 When it comes to making a recipe paleo-friendly, a favorite practice that many people like to use to cut down on carbohydrates is to replace bread products like wraps with lettuce leaves. There’s nothing like the crunch of lettuce in this wrap. 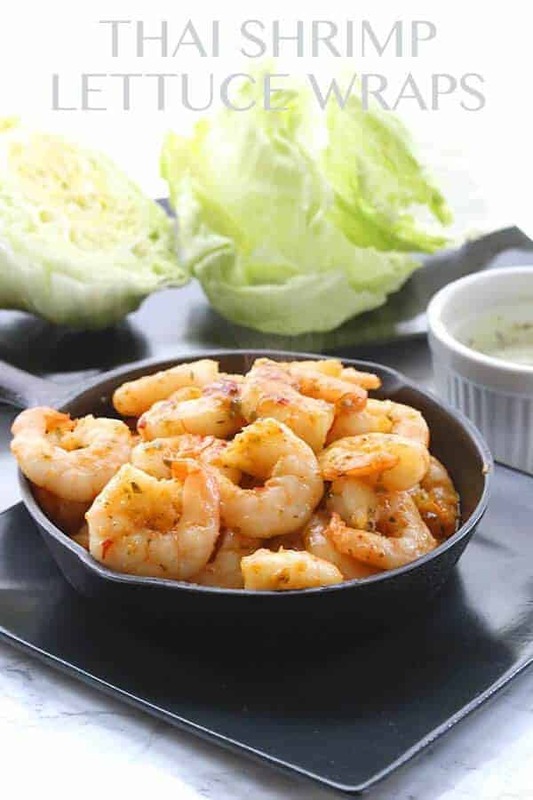 Seasoning the shrimp with paleo-friendly ingredients like coriander, paprika, garlic powder, and cumin and simply fry the shrimp in a paleo compatible oil will give you an intense flavor that is only made fresh by the outer lettuce leaf vessel. Who would’ve thought that you could make delicious chimichurri shrimp and still adhere to a paleo diet? For this delicious recipe, you’ll need to make some chimichurri sauce, and using an Argentinean recipe that calls for fresh herbs, onions, and lime juice is a great way to infuse the dish with vitamins and minerals. 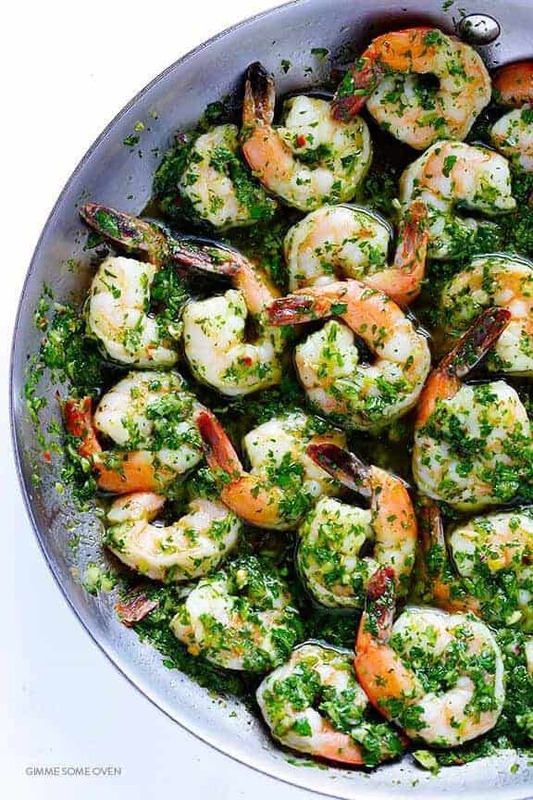 This dish really delivers on South American flavor and provides just the right amount of kick to accent the large shrimp that you’re using as the meat of the dish. 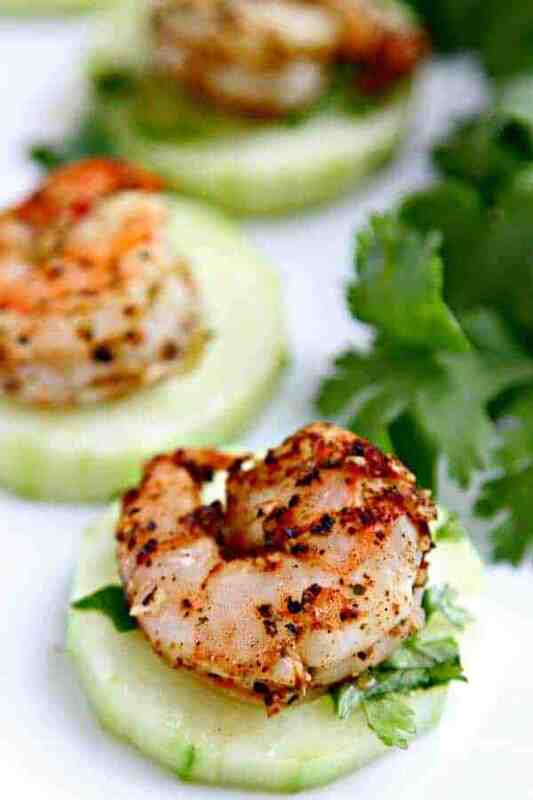 Shrimp and cukes, what could make for a more delicious dish? This recipe plays on a very Hors d’oeuvre type of theme and also makes for an excellent, paleo friendly snack. 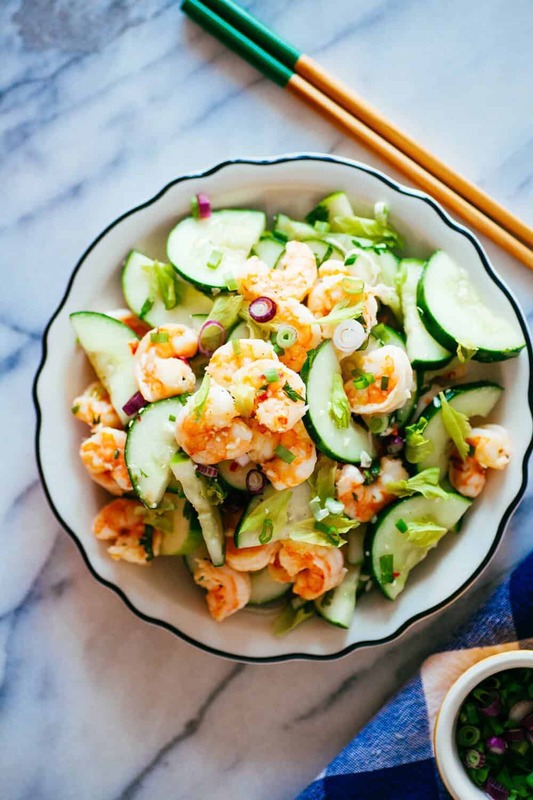 The shrimp is lightly seasoned and fried in a combination of spices and some cucumbers that have been sliced and seasoned with a dressing of olive oil, cilantro, lime juice, and salt and pepper. This combination makes a fresh and delicious meal. If you want vegetable pasta, but don’t like spaghetti squash, then you can always spiralize some zucchini in order to produce some paleo-perfect zucchini noodles. Zucchini and shrimp make for the perfect culinary combination and in this dish, you can also throw in cherry tomatoes and red pepper flakes that will make it all taste like a meal straight from Tuscany. In addition to these ingredients, you’ll also need white wine, butter, and lemon juice to complete flavor. This is really the perfect paleo recipe to help you really start to love what this type of diet has to offer. Avocados are a rich creamy veggie that has tons of healthy fat and important vitamins. This paleo recipe emulates the shrimp towers that some sushi joints around the world serve. Since rice is a no-no for paleo, you can use cauliflower rice instead. 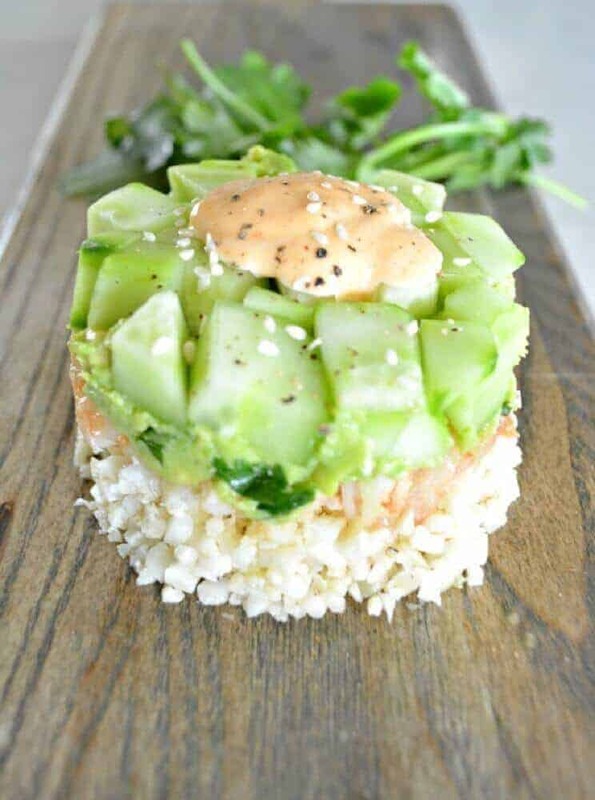 You’ll be dicing your ingredients, which include avocados, shrimp, and cucumber and serving them on top of the cauliflowered rice with some paleo friendly mayonnaise. You can also throw in some coconut aminos, cilantro, and sriracha for a well-flavored dish that’ll please the palette. 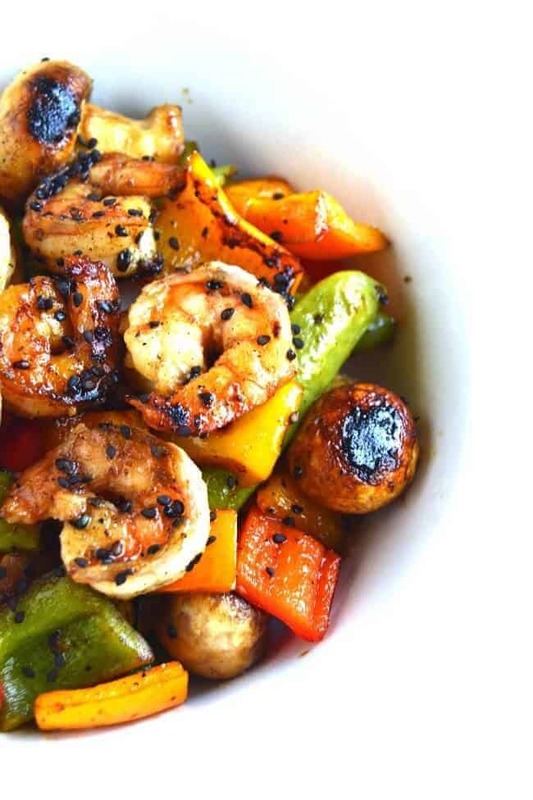 Shrimp and vegetables make for an excellent combination that is at once, delicious and perfectly aligned with a paleo diet. Grilling the ingredients for this dish provides a delicious charred-on flavor that many people don’t easily associate with paleo living. This dish calls for black sesame seeds, which are a perfectly nutritious addition to the recipe. 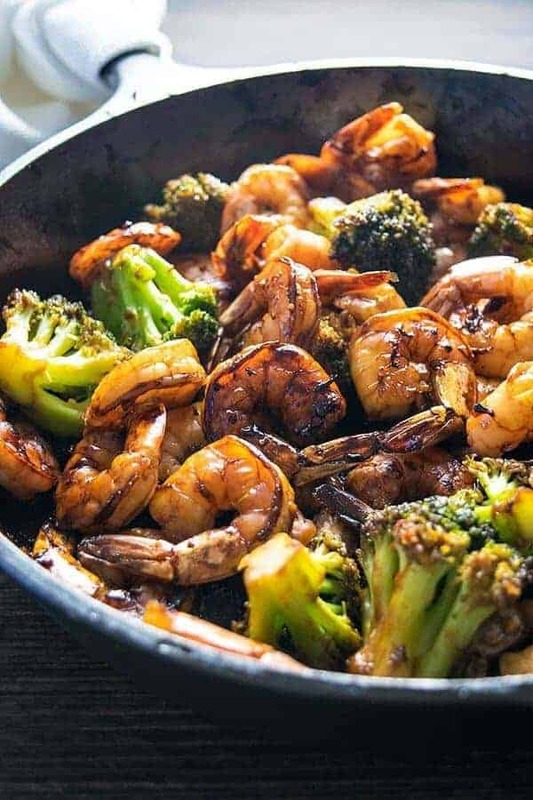 Once you’ve marinated the shrimp in a sauce of the black sesame, some soy sauce, sesame oil, and garlic, simply toss them on the grill and cook them up with some veggies for a delightful dish. This dish is an easy to make meal that is simple and perfectly paleo diet friendly. 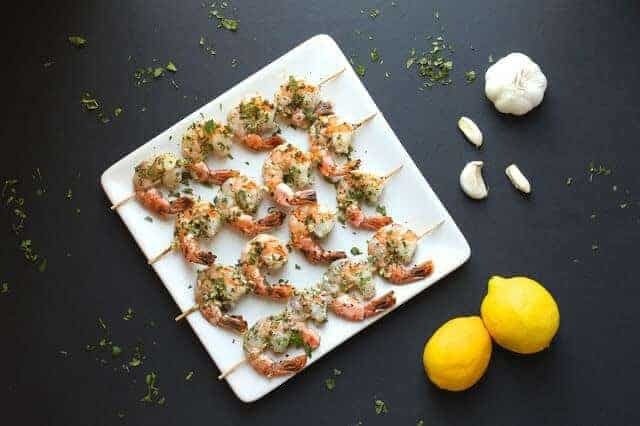 It mixes flavorings like Italian seasoning, lime juice, and dried basil, then adds them to large shrimp and roasts them all on wooden skewers over a grill. You’ll love the way each skewer tastes as you remove them, freshly seared from the grill. If you want to mix things up a bit, you can even baste on some paleo-friendly barbecue sauce. Shrimp and coconut have flavors that really mesh well together, add in a bit of sweet chili and you’re in for a unique and delicious flavor experience. As another skewer dish, this recipe is relatively easy to make. You’ll simply need to throw together some shrimp, some coconut cream, and some sweet chili sauce. Sear on both sides until the shrimp for a hot and sweet paleo food that will be loved by all. Another great grilled dish, this easy recipe is simple to make and is thoroughly aligned with the paleo way of preparation. 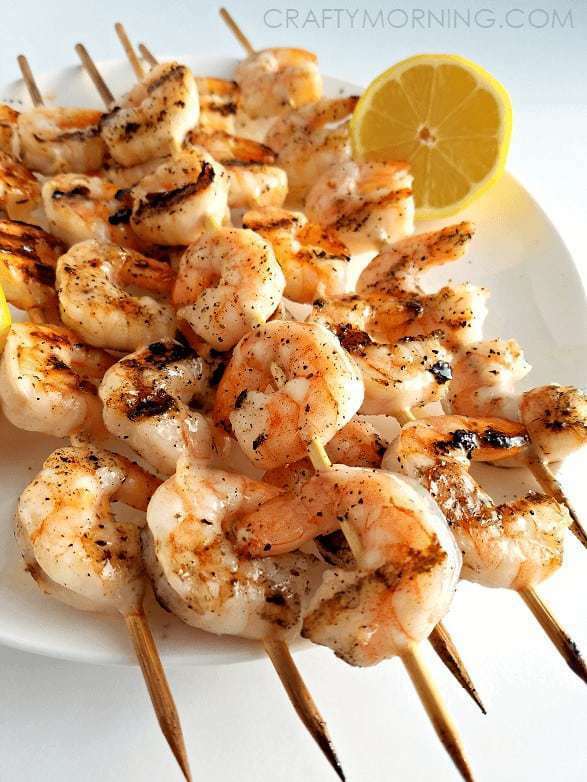 First you’ll have to prepare the shrimp on the grill with skewers, and then add delicious lemon butter sauce to them so that they fully covered before serving them. This dish can easily be served on a bed of cauliflower rice or even atop a dish of similarly grilled vegetables; the choice is yours. What makes this a perfect paleo dish is how easy it is to prepare. Sometimes you just have to kick it up a notch, and adding a bit of deliciously spicy flavor can really change the flavor profile of a dish. This paleo recipe calls for a bit of minced garlic and red pepper flakes in order to add a bit of nuance to the dish. 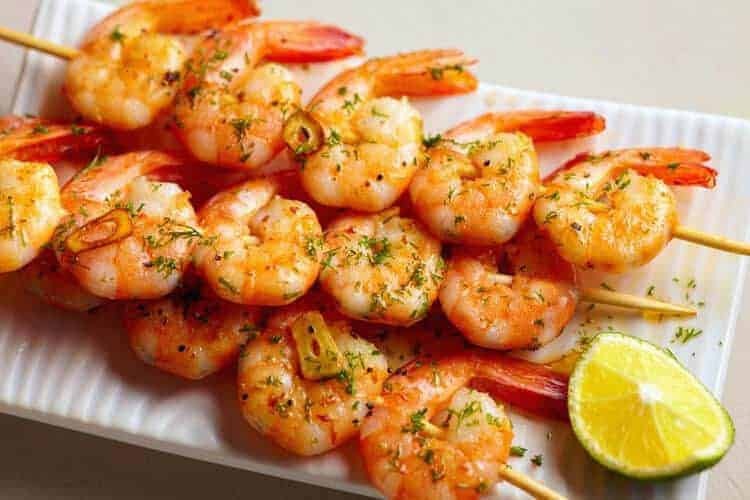 The recipe also calls for shrimp that has been marinated in some natural citrus flavors like lemon juice and zest. If you want to really kick up the color, fry up the spicy garlic shrimp with some finely chopped yellow and red peppers. How many full meals are there out there that you can honestly say only take 20 minutes to prepare? This is the perfect quickly prepared meal that is a great paleo food option. 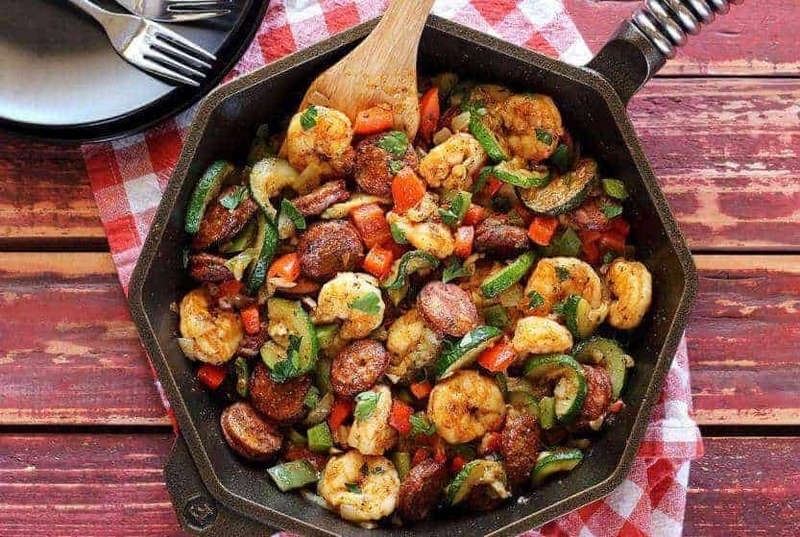 Once again, this meal couples shrimp with zucchini to form a delicious surf and turf style dish that incorporates flavorful sausage into the mix. Just fry up the ingredients in a skillet with some coconut oil. Don’t be afraid to add in some peppers and old bay to help this dish deliver on delicious taste. Quinoa is a great seed-based rice alternative that has much less of the annoying carbohydrates that are typically found in rice. In addition to this, it’s gluten free and has a ton of helpful vitamins like iron and folic acid that are particularly friendly to the paleo lifestyle. When you prepare this in your kitchen, add in some onion, garlic, chili powder, and some other seasonings to kick the taste up a notch. 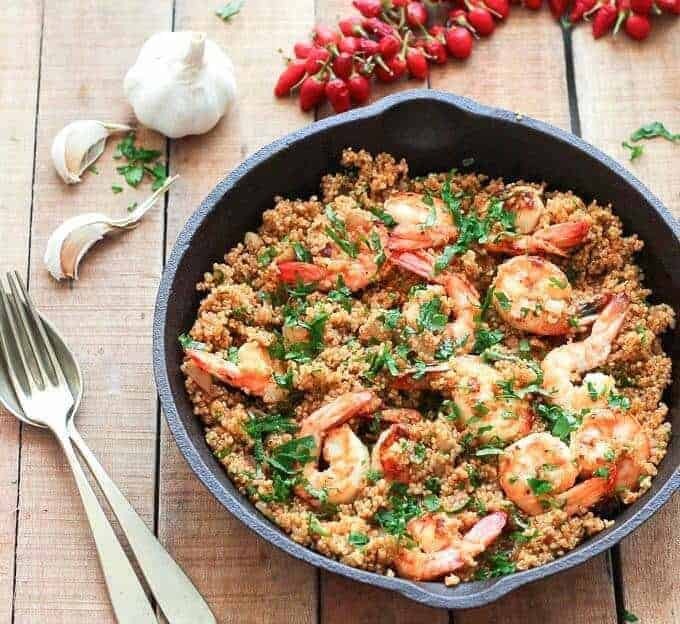 Prepare the quinoa with the seasonings and sear the shrimp before drizzling in some lemon juice, and you’ll have an excellent dish. 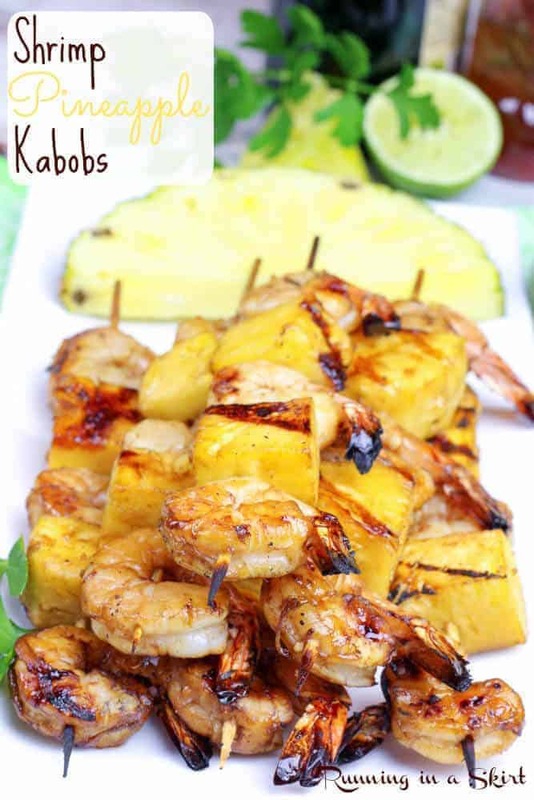 Another great skewer recipe, this one calls for the deliciously acidic and sweet flavor of pineapple. 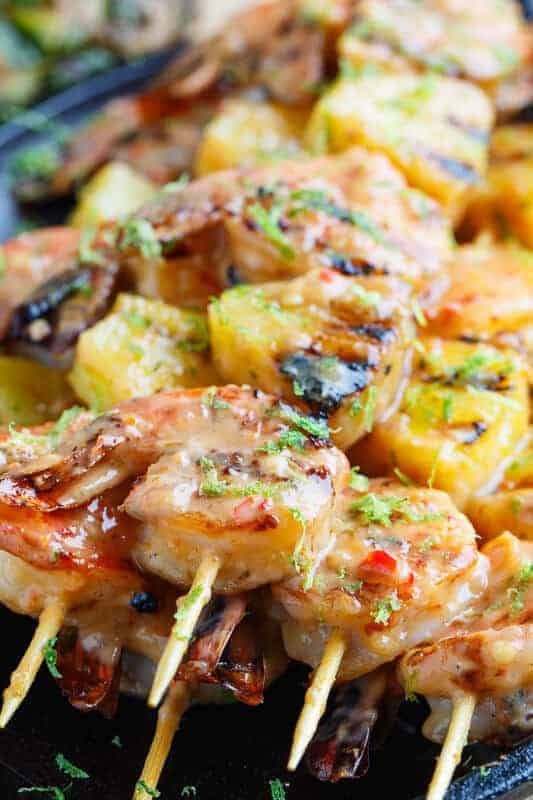 To craft this recipe you’ll simply have to align your deveined, de-shelled shrimp with pineapple chunks on the wooden skewers. 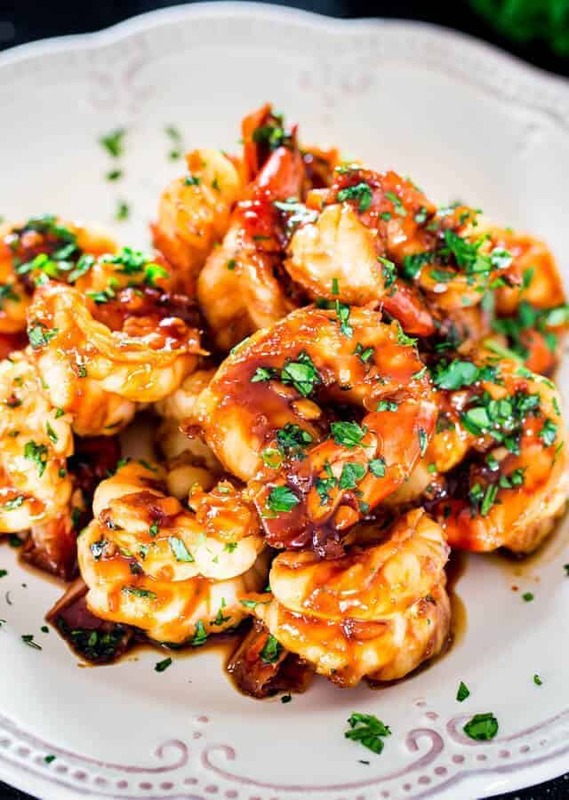 The unique flavor of this dish comes from a minced garlic, honey, and balsamic marinate that the shrimp bathe in for an hour. Once the time is up, toss the whole thing on the grill for a delicious meal. 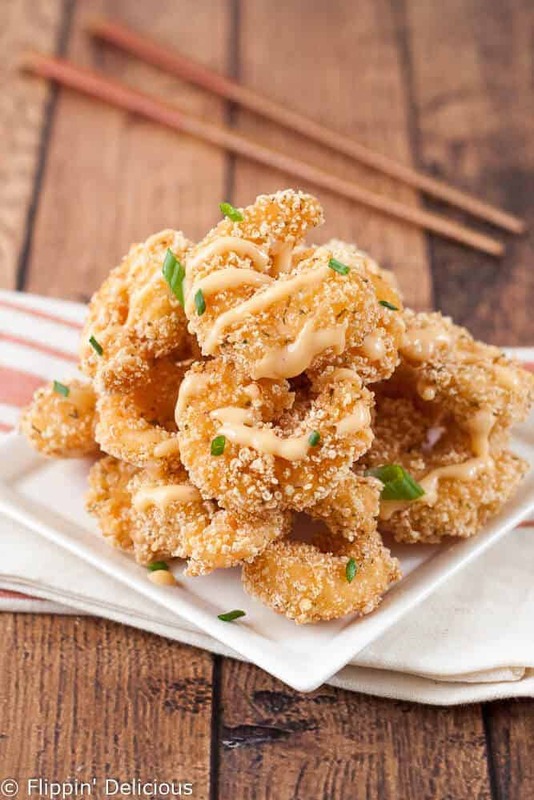 Bang Bang shrimp is one of the most popular recipes at bonefish grill, but did you know that you can make a paleo compatible recipe right in your kitchen? This recipe calls for coconut milk, some parsley, and a homemade bang bang sauce. This dish is plenty hot because the sauce calls for chili sauce. Once you’ve mixed the batter and fried the shrimp in coconut oil, mix together the bang bang sauce and you’ll be in business. Sometimes the best things in life are deceptively simple. This is one deliciously simple dish that merely combines some delicious veggies with the shellfish we all love. 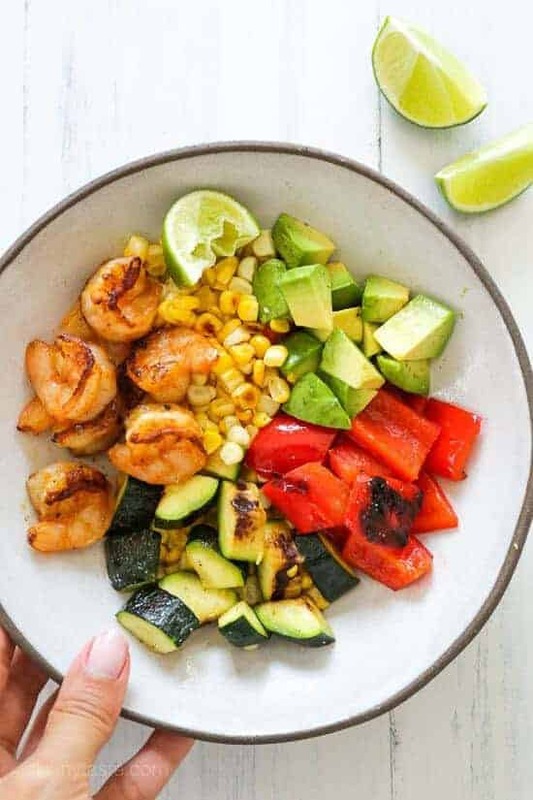 Most veggies will do, but corn, zucchini, haas avocados, and bell peppers make for a perfect accompaniment for the shrimp. Every ingredient in this dish should be grilled, so simply cook them fully; veggies first then shrimp. After they are cooked toss them all in a bowl to combine and serve. Almost any shrimp dish is an easy recipe. This is because shrimp cook up so fast on most surfaces, especially the grill. This is also another shrimp dish where you’ll have to marinate, but you’ll only need to do this for about a half an hour. 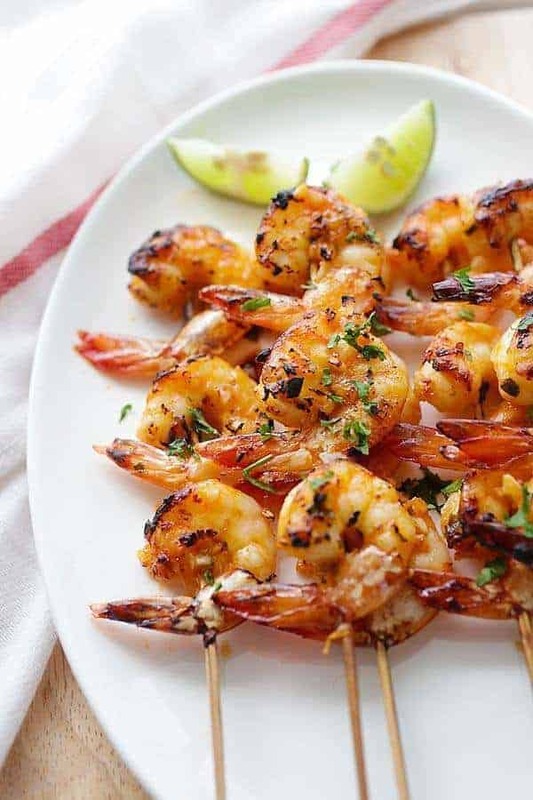 Once marinated in the mixture of lime juice, olive oil, garlic, and some seasonings, skewer and toss the shrimp on the grill and dress with avocado cilantro sauce. You can use frozen shrimp for this recipe if you do not have fresh on hand. 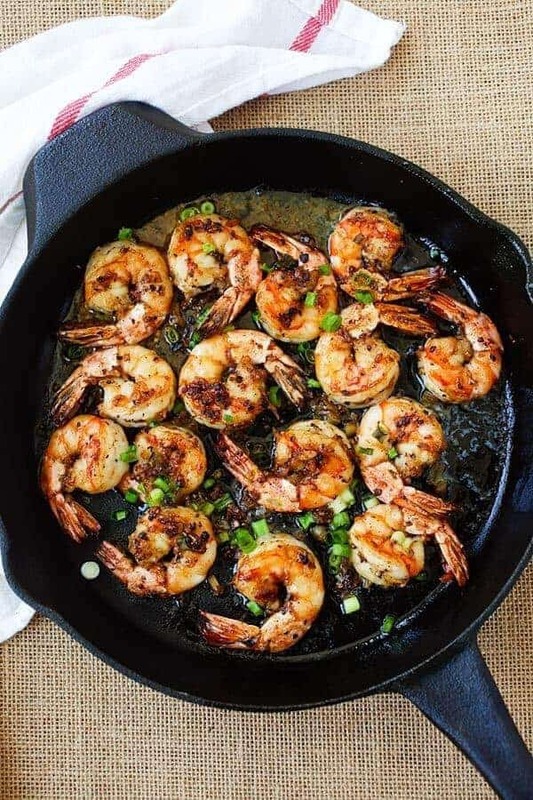 This is also a perfect dish for using a cast iron skillet, and since shrimp cooks so quickly, start with the vegetables for a one skillet meal. 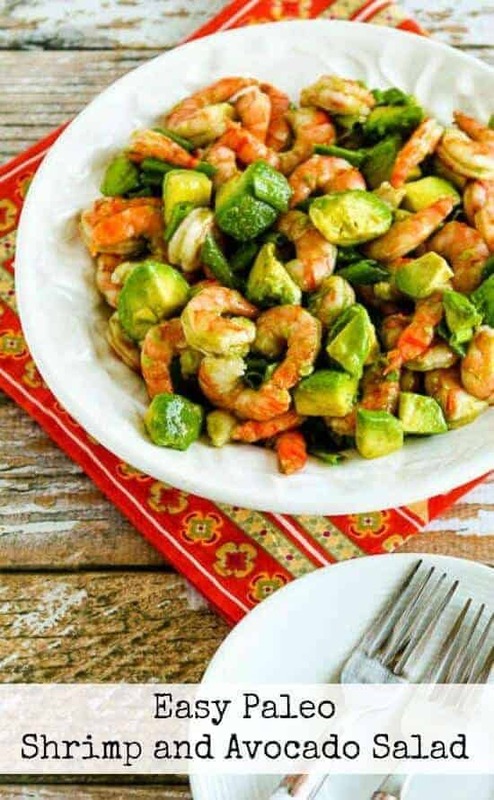 Seared brussels sprouts with some seasonings like salt and minced garlic are the perfect vegetable to combineto the shrimp. Once you’ve made a sauce for the shrimp, drizzle and serve immediately. This is another sushi-style shrimp stack that is the perfect afternoon meal on any given day. 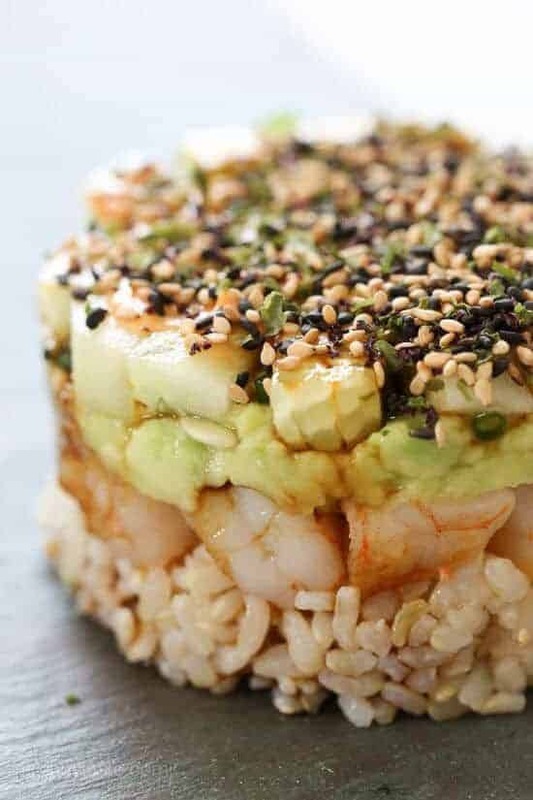 Of course, you’ll be using cauliflower rice for its base, but add to this sliced shrimp, cucumber, mashed avocado, and black sesame for a truly unique Japanese-inspired meal. You can also use furikake, a Japanese seasoning that can utilize seaweed and sesame seeds, to really add a unique flavor to this meal. This Asian-inspired recipe calls for the utilization of both shaoxing wine and oyster sauce. You’ll also be using black peppercorns for the “black pepper” part of the recipe. Make sure to sear the shrimp well to create a flavor that you would experience in a restaraunt. Once you add the shrimp you have a delicious meal that’s extremely flavorful. If you want a side, a side salad, spaghetti squash, or spiralized zucchini make the perfect accompaniment. 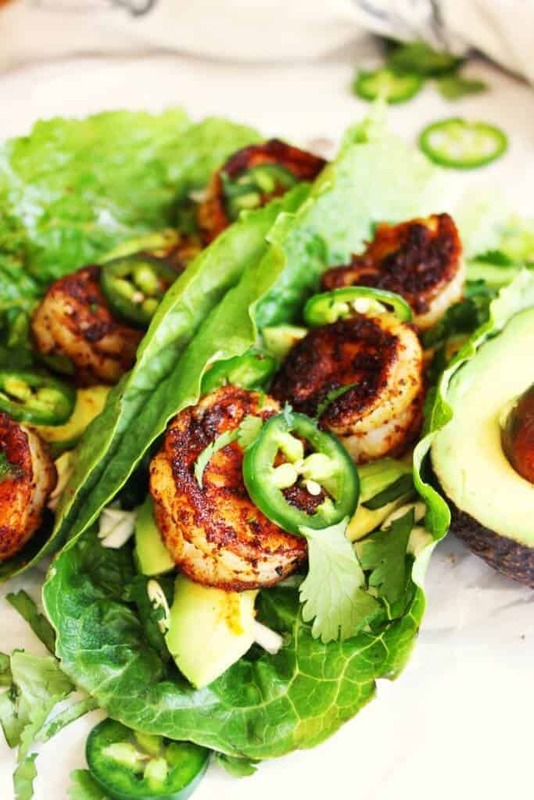 This recipe combines the flavors of fresh seafood, cilantro, and avocado to become one of the tastiest paleo shrimp recipes. You’ll need a food processor for this recipe, as you’ll need to create a cilantro and honey sauce that is fresh and a tiny bit sweet. Once blended, marinade some shrimp in the mixture for 10 minutes and sauté it in a skillet. Toss it in a bowl with avocados, tortilla chips, and lettuce and you’ll have a delicious salad that is sure to be a hit. This Thai-influenced recipe blends some delicious Asian flavors that are also perfect for a paleo diet. You’ll need Thai sweet chili sauce for this recipe as well as some flavorful fresh cilantro. For the shrimp, you may want to leave the tail on for an easy place to dip from. 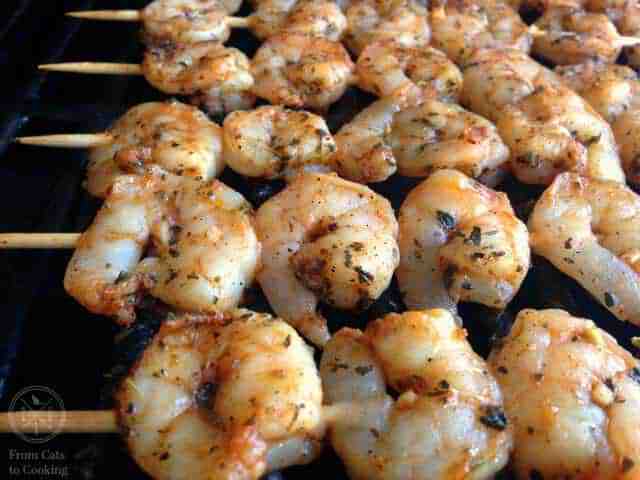 You’ll make a marinade out of the sauce, the cilantro, and some seasonings and marinate the shrimp for 30 minutes. When done, skewer, grill, and serve. 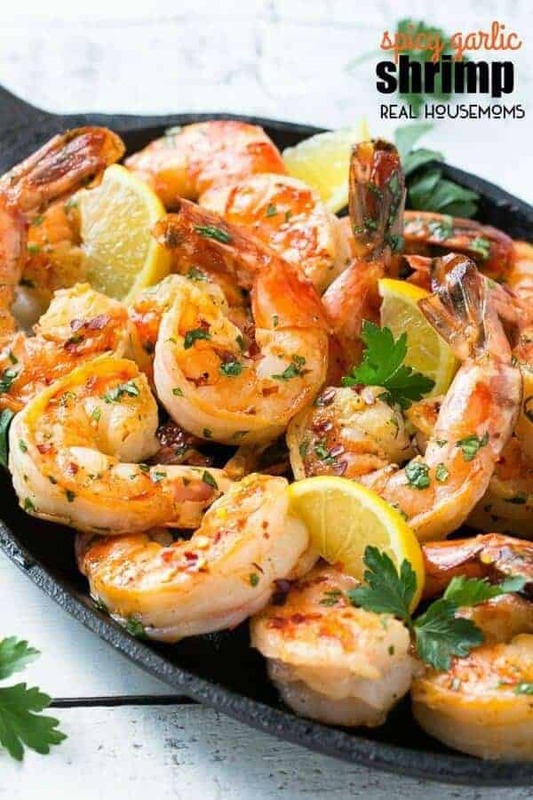 Lemon and garlic create the perfect flavor combination for seafood, especially when it is in a sauce that is tossed with shrimp, which is why this paleo-friendly recipe is a classic that you must try. Don’t forget to add some cilantro for a unique flavor that will add a bit of freshness to the dish as well. 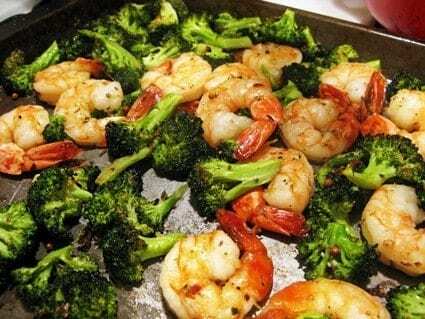 If you want more than shrimp, you can add some vegetables to the skewers as well. Salads are perfect for a paleo diet, but when you add shrimp to the meal, it becomes an amazing creation. This salad is a cucumber salad with onions, peppers, and celery greens, which is a perfectly fresh way to eat this meal. It is an easy recipe to make, and lime juice is all you need for the dressing. If you want more greens in the salad, a bit of peppery arugula will be a perfect addition. 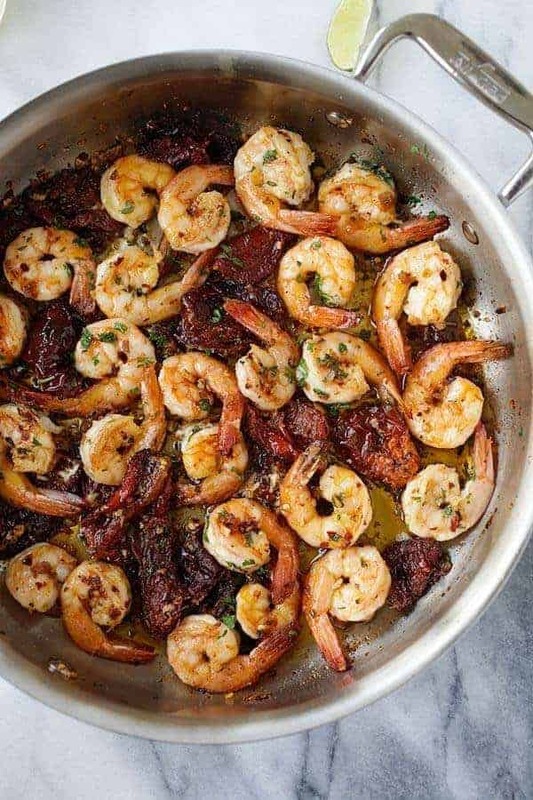 If you like the taste of Spanish food, then this garlic sun dried tomatoes and roasted shrimp dish is an easy recipe to make that you should add to your meal rotation. The spice combination that the recipe requires creates a savory, yet sweet taste that you are sure to fall in love with. This dish is perfect with a side of riced cauliflower or a small side salad if you prefer. This next recipe is an easy dish that you can make in your kitchen at home with very little effort, which makes it a perfect meal to create after a long day. 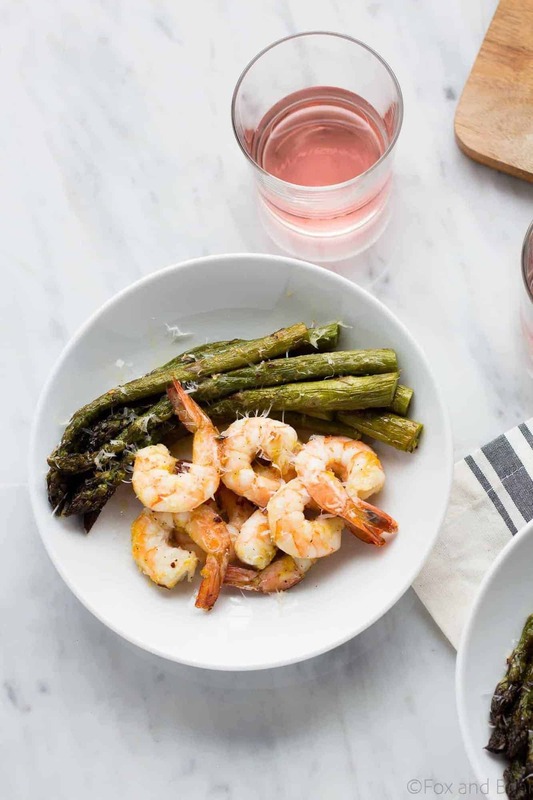 It is a simple one pot meal of shrimp and asparagus that is drizzled with oil and lemon juice and roasted in the oven. If you want some heat, add red pepper flakes. You can also sprinkle the dish with parmesan if you prefer a cheesy flavor. Our last recipe is a take on the lemon and garlic skewers that are already on this list. This variation uses lime juice instead, which gives it more of a salsa-inspired flavor that you can even add tomatoes to the skewers if you like. These taste best on the grill, but if that is not an option for you, then roasting them in the oven is a great alternative that allows you to cook them in your kitchen.